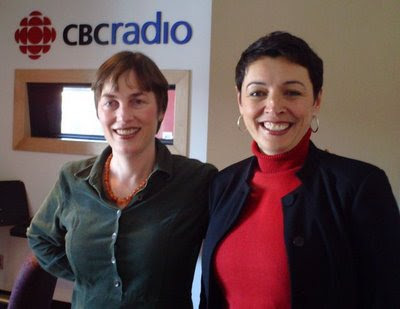 Photo: Ramona Deering, CBC Radio Noon host (left) and Sheila Downer, SmartLabrador (right). On Friday, January 16th, CBC Radio Noon in St. John's hosted a phone-in Crosstalk on the theme of intangible cultural heritage, with guests Sheila Downer of SmartLabrador and yours truly, Dale Jarvis. Interested listeners called in on topics ranging from boat and kayak building to traditional dancing and community oral history projects. "Further to the gentleman reciting the compass.......my uncle who was from Keels, Bonavista Bay and who died in 2007 at 82 years of age, could also recite this. He was not a fisherman nor was he a person given to recitation. I thought he had learned this at school.....maybe in the Royal Readers?" If you have any information on the compass recitation, you can post a comment here, or email Dale Jarvis at ich@heritagefoundation.ca. Download the Radio Noon ICH podcast here in MP3 format.